Most Viewed: What the YouTube community is watching. Tap All to see the most watched YouTube videos of all time. Tap Today or This Week to check out the videos most currently in vogue. 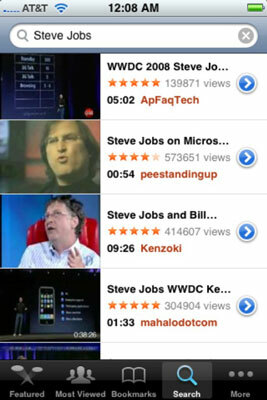 Bookmarks: After stumbling on a video you like, bookmark it by tapping the Bookmark control. Find Steve Jobs on YouTube. Only four YouTube icons (besides the More button) appear at the bottom of the screen at any one time. If you’d prefer a different button than one of the four shown — Top Rated instead of Bookmarks, say — you can make it one of your Fab Four icons. To change the icons shown on that first YouTube screen, tap More and then tap Edit. Then simply drag your preferred icon (Top Rated in this example) over the one you want to relegate to the YouTube bench (Bookmarks in this case). You can also rearrange the order of the icons by dragging them left or right.